I love the single minded nature of panoramic format. It forces you to make choices about what is critical to your image. Everything looks cool in panoramic format… The interesting proportions of the format can make up for considerable weakness in your composition technique. Movies look great in 16:9 format – it is pleasing to the eye. Panoramic format is the same. Point it, get the rangefinder spot lined up, and shoot. It will probably come out looking awesome! Panoramic format is pretty good at capturing a suggestion of lateral movement – the wide frame helps the viewer imagine where the subject is heading. You gotta crop. Crop. Try something different. The pano format welcomes something a bit different. The format requires you to sacrifice subject matter to create a pleasing image. No matter what you do, you are never going to fit everything into the vertical space available. Be adventurous with your composition. The photo above is kinda all over the shop, but it works for me because of the movement of the subject towards the door, and the skewiff perspective suggests the motion of the train as it trundles along. MSP, I want to give Panoramas a try! How can I get into it? For those on a budget level of “tight arse” : Grab your camera and set up your editor with a crop frame that is proportioned to panoramic dimensions. The down side is that you are doing the composing in post, rather than through the viewfinder. For those who want some versatility : There are a couple of medium format cameras that either have a kit to insert 35mm film into the camera to achieve a panoramic effect, and frame lines that pop up in the viewfinder to aid composition. For those who feel they can make a small commitment : Why not try a toy camera from the Lomo crew? The Sprocket Rocket is a 35mm camera that is a bit on the plastique dodgy side, but for about a hundred bucks you can either get panorama fever out of your system, or confirm your format love. 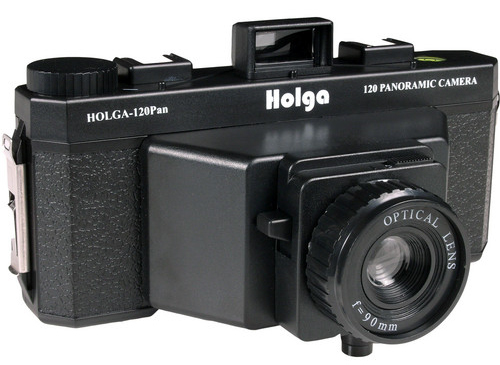 Another cheap option is the Holga Pan. It shoots medium format film in pano format, but the lens is not particularly wide angle. For those who have too much moolah burning a hole in their pocket : The Hasselblad XPan 35mm system beckons.